The idea behind preclearance is to speed up the transportation of cargo and ease border congestion. 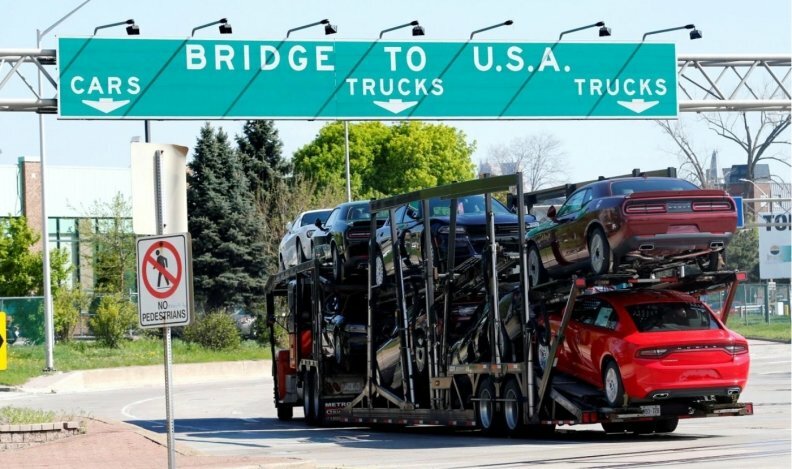 WASHINGTON — Imagine having a U.S. customs facility attached to an auto plant in Ontario, or trucks clearing Canadian customs in Florida, Arizona, or Chicago, all with the goal of helping cargo and people travel faster between the countries. The Canadian and American governments are discussing those ideas. Public Safety Minister Ralph Goodale said he envisions a future where cars can have their components screened and sealed for shipment right inside the plant. Given that auto parts might cross the border a half-dozen times, he said that would avoid snags and boost productivity. “The real prize of preclearance is when we could expand it from passenger to cargo,” Goodale said. The head of the Canadian Automotive Parts Manufacturers’ Association told Automotive News Canada that “its a complicated issue from a public safety point of view,” but that it’s also something that’s been talked about. Canada and the U.S. have begun talking about expanding preclearance — with plans to discuss potential sites for the first-ever Canadian customs facilities inside the U.S., and the longer-term goal of applying it to commercial goods. "You've got an administration on the American side and certainly on our side, that really want to move these files," Goodale said Monday, after his first face-to-face meeting with his new U.S. counterpart — Homeland Security Secretary Kirstjen Nielsen. The Japan Automobile Manufacturers Association (JAMA) has not been involved in any recent discussions about preclearance but it supports improvements to the current system, spokesman David Worts said. “Recognizing that about 80 per cent of our members light vehicle production in Canada is produced for export mainly to the U.S., we would generally be in favour of a preclearance system for the reasons cited by Minister Goodale,” Worts said. The auto industry and other stakeholders were part of the activities of the U.S.-Canada Transportation Border Working Group, Worts said. The Canadian Vehicle Manufacturers' Association has ongoing conversations with Canada Border Services Agency and the Ministry of Public Safety. Several manufacturers already use the Trusted Trader Program, which allows businesses to declare they are secure and low-risk traders. It leads to what Nantais describes as essentially “a rolling inspection” at the border. “The more important thing for us is that our Trusted Trader shipments go through with the least resistance as possible,” Nantais said. While he considers the program a success, the more seamless the border becomes, the better. That’s because the integrated auto industry relies on just-in-time delivery. Every time a line goes down, it costs an automaker $1.5 million an hour, Nantais said. “Cost is always an issue and for such measures to be embraced, the extra cost of the security measure would need to be less than the existing costs and inconvenience associated with multiple screenings and inspections,” Adams said. Preclearance has a long history. It began decades ago with U.S. border facilities in major Canadian airports — allowing people to clear customs at home, avoid logjams in U.S. hubs and fly directly into U.S. airports that don't have customs facilities. A few years ago the Harper and Obama governments agreed to new rules allowing the practice in every mode of transport — rail, cars, buses and ships. The Trudeau Liberals approved pilot projects at rail stations in Montreal and B.C. Now, with the Trump administration, the countries are working on two future phases. Goodale said he already began discussing a first phase with Nielsen's predecessor — installing Canadian facilities inside the U.S.
"John Kelly and I had a conversation about, 'Where would we start?' He thought Boston — his hometown. Some Canadians suggested either Fort Lauderdale, (Florida), or Scottsdale (Arizona) — the (places with) snowbird traffic in the winter," Goodale said in an interview. "Midwesterners would say Chicago. ... Or somewhere in the American northeast," he said noting that Canadian ski resorts would appreciate quicker access for American travellers. "There are lots of ideas." But the bigger long-term goal involves cargo. The countries have agreed to meet this spring to develop a plan on what regulatory changes might be required to introduce preclearance for cargo beyond a pair of previous pilot projects. He said he left the first meeting with Nielsen feeling positive. "Really good meeting," he said. "You wonder in the first encounter: Will there be a list of complaints or grievances? No. There's a list of important issues we're working on together... It's a really good, constructive, international to-do agenda."